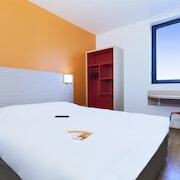 Well situated a couple of minutes walk to Gare Saint Jean and the Bus Station. Nice restaurants around. Where to find Bordeaux hotels near an airport? 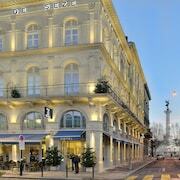 How can I find hotels in different Bordeaux neighborhoods? Where can I find hotels in Bordeaux that are near tourist attractions? There are accommodation options aplenty for those who are looking for a cheap or luxurious place to stay in or around Bordeaux. Spend some time checking out our 134 accommodation options, all of which can be found within a 0.1-kilometre (0.1-mile) radius of downtown Bordeaux. The Intercontinental Bordeaux Le Grand Hotel and Le Boutique Hotel are some of the most centrally located lodgings in Bordeaux. Quartier du Lac is a neighborhood that is 6 kilometres (4 miles) from the middle of Bordeaux, and offers the biggest selection of Bordeaux Expedia-listed hotels. The Hotel Pullman Bordeaux Lac and Mercure Bordeaux Lac are some of the Expedia-listed accommodation options in and around Quartier du Lac. Rue Sainte-Catherine, around 0.2 kilometres (0.1 miles) away, is where you'll find Intercontinental Bordeaux Le Grand Hotel and Quality Hotel Bordeaux Centre. Expedia hotels in Chartrons include the Seeko'o and Mercure Bordeaux Château Chartrons. Chartrons is 2 kilometres (1 mile) away. Of course, a visit to Bordeaux wouldn't feel complete if you don't take a trip to the Aquitaine Museum. 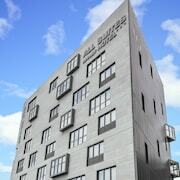 The Hotel Burdigala Bordeaux MGallery by Sofitel and La Maison Fredon, are good options for travelers as they are within walking distance of the Aquitaine Museum. The La Maison Bord'eaux and the Best Western Grand Hotel Francais are both conveniently near the Contemporary Art Museum. The La Réserve au Pavillon de Château Raba and the Les Chambres au Coeur de Bordeaux are close to the Chateau Haut Brion. Place de la Bourse, another popular Bordeaux attraction, is walking distance from the Qualys-Hotel La Tour Intendance and the Hotel Mercure Bordeaux Centre Gare Saint Jean. 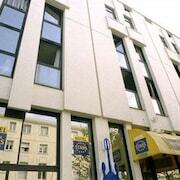 Hotels that are near Place des Quinconces include the Hôtel des 4 Soeurs and the Novotel Bordeaux Centre. The Hôtel Continental by Happyculture and Mercure Bordeaux Cité Mondiale Centre Ville are conveniently close to the Natural History Museum, and the Mercure Bordeaux Centre and Aparthotel Adagio Bordeaux Gambetta are close to Greek Orthodox Church. 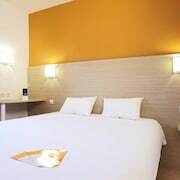 Those traveling to Bordeaux for Hotel de Ville Palais Rohan could stay at your choice of the Best Western Gare Saint Jean and Aquitain Hotel. Alternatively, if your focus is on Notre Dame Church, your nearby hotel options include the Cœur de City Hôtel Bordeaux Clemenceau by Happyculture and Hotel Campanile Bordeaux Centre - Gare Saint-Jean. Located 9 kilometres (6 miles) away from Bordeaux is Merignac Airport. Stay nearby at Château Pape Clément - Bernard Magrez Luxury Wine Experience or Mercure Bordeaux Aeroport. What are the most popular Bordeaux hotels? Are there hotels in other cities near Bordeaux? What other types of accommodations are available in Bordeaux? Explore Bordeaux with Expedia.ca’s Travel Guides to find the best flights, cars, holiday packages and more!